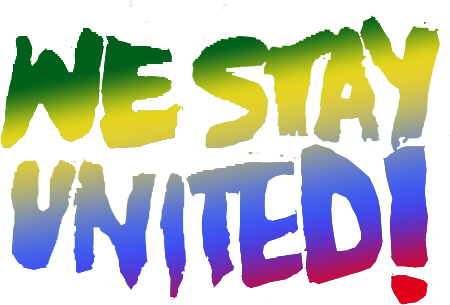 Wuppertal goes to „We‘ll come United“! But despite all the joy of expecting many friends from all over Germany to come together and a big, powerful anti-racist parade, the signs have changed since Berlin last year. The racist AfD is now the strongest opposition in the Bundestag and the other parties are increasingly assuming right-wing positions. Inhumanity became part of the government programme – which does not prevent rights and racists from articulating even more anti-human positions. The criminalization of sea-rescue is not enough for them, they want more: The extermination by drowning of all who are forced to flee across the Mediterranean, as, for example, was loudly demanded by a large number of „concerned citizens“ at a „Pegida“-rally in Dresden. And if refugees have nevertheless made it to Europe, they want to hunt them through the streets, as it is currently the case in Chemnitz or on a daily basis in many towns and villages of the province. The racist Germany, which has been secretly hidden for a long time and which was mostly described by those who were confronted with right-wing violence in everyday life because of their origin, their skin-colour or their „otherness“, feels strengthened and has openly taken up the struggle for the cities in many places not just since „Chemnitz“. This ethnic-racist Germany has now become clearly visible to everyone, even if many media and politicians still avoid calling it by its name. However, our friends, our neighbours and colleagues with an old or with a new migration story do not need names for this either. They have known racist Germany for a long time: they meet it in everyday life, it tries to frighten them and it has never stopped excluding them. The majority society in Germany has barricaded itself far too long behind illusions and left them alone. Nothing has made this as clear as the NSU-complex and the treatment of the victims of right-wing terror and their families. There is no more time for illusions when fascists are openly fighting for the streets as they did in Chemnitz. Fascist and racist demonstrations of power and a policy that takes a racist stand can only be countered by our own common strength. Despite a constant media fire, which tries to make every kind of immigration an all-encompassing problem, and despite politicians who outbid themselves with new exclusionary demands every day, the willingness of millions of people to live together remains unbroken. And at the latest with the inhumane prevention of the sea-rescuing in the Mediterranean and with increasing deportations of new friends, a line has been crossed for many who have concentrated on purely supportive initiatives so far. This is made clear by the mass participation in the „Seebrücke“ campaigns in many cities. Now it is high time that this outrage becomes solid solidarity. There is no more uninvolved watching. Now it counts! Respect Existence or Expect Resistance! It is time that all those who do not accept the racist rollback and do not want to leave a place in public space to the openly acting racists, show their strength together with those affected by racism. It is time that they show that they really are more than those who claim they are some imaginary „Volk“. „We’ll come United“ in Hamburg, planned by refugees, migrants and anti-racist structures long before the current events, offers an opportunity to do so on 29 September: For all those who have committed themselves in recent weeks to a “sea-bridge”; for all those who can no longer bear the fear of deportation of their friends; for all those who want to push back fascism and, of course, for all those who live here and have an old or new migration history. They should make the motto of the demo parade come true and go to Hamburg together. A really big demo parade will not wipe out the normal racist state. That takes a lot of time. But it will give new strength and confidence to jointly take up and win the necessary fight against fascists and racists in our everyday life, in authorities, businesses and schools, at the universities and in the neighborhoods of our districts. It will be an undeniable and unmistakable symbol that we are no longer willing to accept the normal state of racism and that we will fight back together. On September 29th we will cruise against the dominating winds with many thousands and a fleet of music- and motive cars. Come with us! Stop deportation – right to stay for all! No Lagers! Apartments for all! Participation of all who live here! 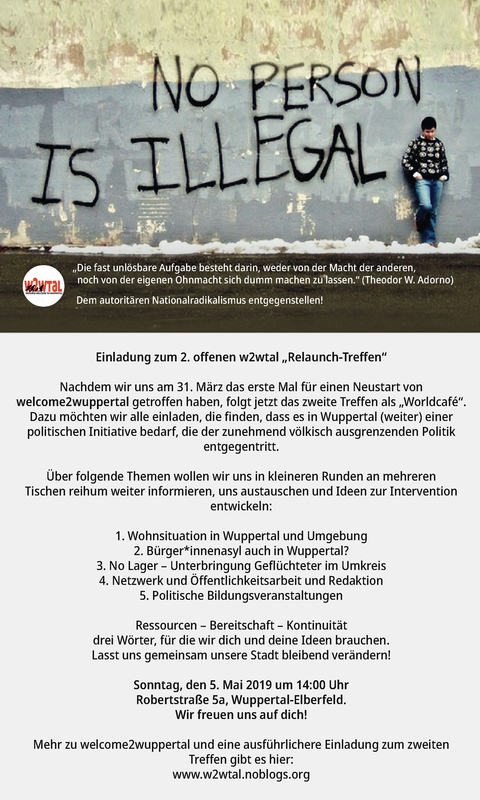 welcome2wuppertal (w2wtal) ist eine Initiative von Menschen die schon lange in der Stadt leben und neu Zugezogenen. Gemeinsam wollen wir selbstorganiserte und konkret solidarische Strukturen schaffen, die allen hier Lebenden eine Partizipation und das Recht über unser Leben mitzubestimmen ermöglichen. Beteiligt euch, kommt vorbei, macht mit! Wenn ihr Fragen habt, schreibt uns einfach eine E-Mail (nutzt bei sensiblen Inhalten das verschlüsselte Formular), und wenn ihr über w2wtal-Treffen informiert werden möchtet, nutzt einen unserer Kanäle bei Facebook, Twitter oder telegram. welcome2wuppertal (w2wtal) is an initiative of people who have been living in the city for a long time and newcomers. Together we want to create self-organized and concrete solidarity structures, which enable all people living here to participate and have the right to have a voice in our community. Participate, come along, join in! If you have any questions, just write us an e-mail (use the encrypted form for sensitive content), and if you want to be informed about w2wtal meetings, use one of our channels on Facebook, Twitter or telegram.